Selection of the power source for your product is one of the most important early decisions that you can make when developing a new hardware product. You have three choices at your disposal: rechargeable batteries, replaceable/disposal batteries, or AC power. Each option has its own set of advantages and disadvantages which we will discuss in detail in this article. NOTE: This is a long, very detailed article so here's a free PDF version of it for easy reading and future reference (includes printer friendly version). Rechargeable batteries are the most common method of powering most modern consumer electronic products. There are a variety of types of rechargeable batteries, but two are most commonly used for consumer products: lithium ion or lithium polymer. A lithium-ion battery uses a liquid electrolyte, whereas a lithium-polymer battery uses a gel-like polymer for the electrolyte. However, most batteries that are labeled as lithium-polymer batteries are really lithium-ion polymer batteries. A true lithium-polymer battery uses a polymer electrolyte, whereas a lithium-ion polymer battery uses a liquid electrolyte (just like a lithium-ion battery) but with a polymer casing. For the rest of this article I will use the term “lithium-polymer” although in most cases it is really a “lithium-ion polymer” battery. Lithium-ion batteries are rigid, hard batteries typically used in laptops and larger products without a requirement to be ultra-thin. 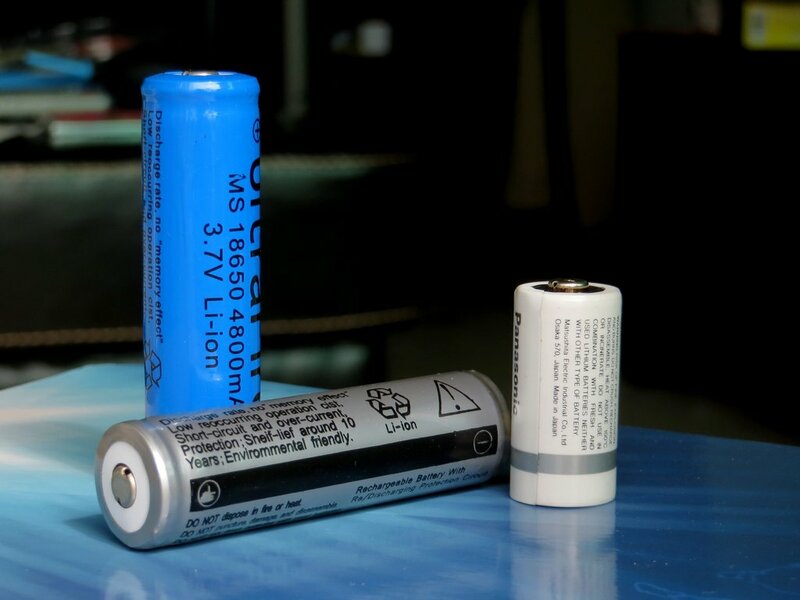 A single lithium-ion battery cell is commonly a little larger than a standard AA alkaline battery, but in most cases several of these cells are grouped together and encased in a plastic shell. Lithium polymer batteries, on the other hand, are more flexible and can be made much thinner than a lithium ion battery. Lithium polymer batteries cost about 10 to 20 percent more than a lithium ion battery, so for larger products it might make more sense to use a standard lithium-ion battery. Figure 3 – Lithium-polymer battery. Note the small embedded PCB with protection circuitry. However, even for larger products, lithium-polymer batteries (which can be made into a variety of shapes) can allow you to pack more battery volume into your product. This allows you to increase your battery capacity/life without increasing your product size. If your product is really small and thin then you’re probably going to want to go with a lithium polymer battery. One significant disadvantage of rechargeable batteries is that they add significant cost to your product. The biggest cost is typically the battery itself. Most products that use replaceable batteries don’t include the batteries themselves, so your product cost doesn’t include the cost of the batteries. Also, you have to factor in the cost of the charger circuit itself. With lithium batteries you will also require a special device called a fuel gauge which monitors the charge level of the battery. These add a little additional cost. Finally, you will need to include an external power charger of some sort (most commonly a USB charger) with your product. Figure 4 – Monitoring the battery level of a lithium-ion battery requires a chip called a fuel gauge. All of this adds some additional cost and complexity. Luckily there are numerous integrated battery charger solutions available that take care of all the complicated stuff involved in charging a lithium battery. One of the other issues with rechargeable batteries is they require additional safety certifications. Some of these certifications are UL1642, IEC61233, and UN 38.3. A lot of the time you can buy stock lithium rechargeable batteries that are already pre-certified but your choices are going to be more limited. Most commercial products ultimately need to have a custom battery made just so the battery can use the maximum available space to increase the battery life and capacity. Once you reach higher manufacturing volumes, you might want to switch to using a custom lithium battery to maximum your product’s battery life. At that time you will be forced to obtain the required certifications. And finally, rechargeable lithium batteries have some serious safety issues. Most of you have seen stories about lithium batteries exploding in Samsung phones. Lithium batteries are potentially very dangerous. So if you’re going to design one of these into your product, you need be aware of the safety concerns. Safety issues are why there are certifications required for lithium batteries. Lithium batteries need a charger and fuel gauge chips, as well as protection circuitry. This circuit will prevent overcharging or shorting the battery which may cause it to explode or catch fire. I recommend that you purchase lithium batteries that already have a protection printed circuit board built into the battery. That way, you don’t have to worry about any design issues causing your product to explode. So the next question is how do you recharge your lithium battery? Let’s discuss the different power sources for recharging a battery. An external power adapter is generally the easiest way to recharge a battery. 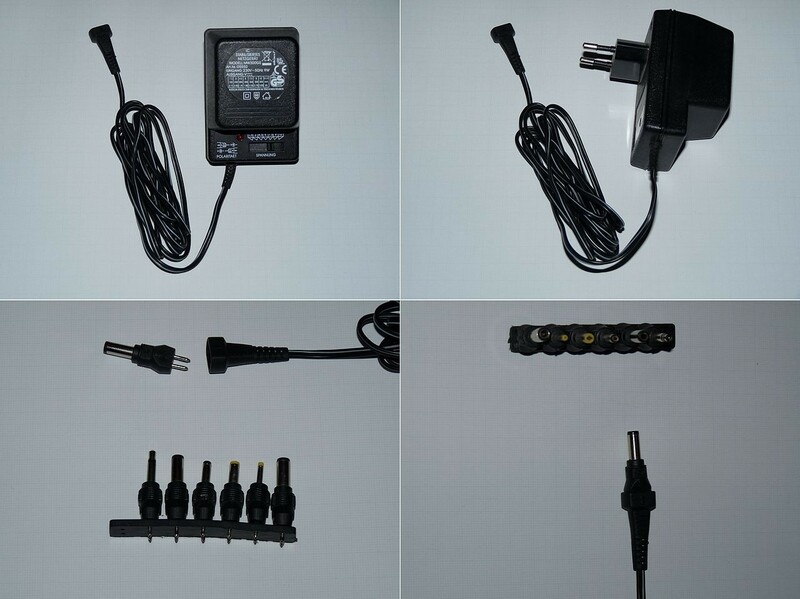 This adapter will plug into an AC electrical outlet then output a DC voltage to your product. Figure 5 – Example of an external AC/DC power adapter. Note the UL certification symbol. Just make sure that you use a pre-certified power adapter so you don’t have to have your product UL certified. 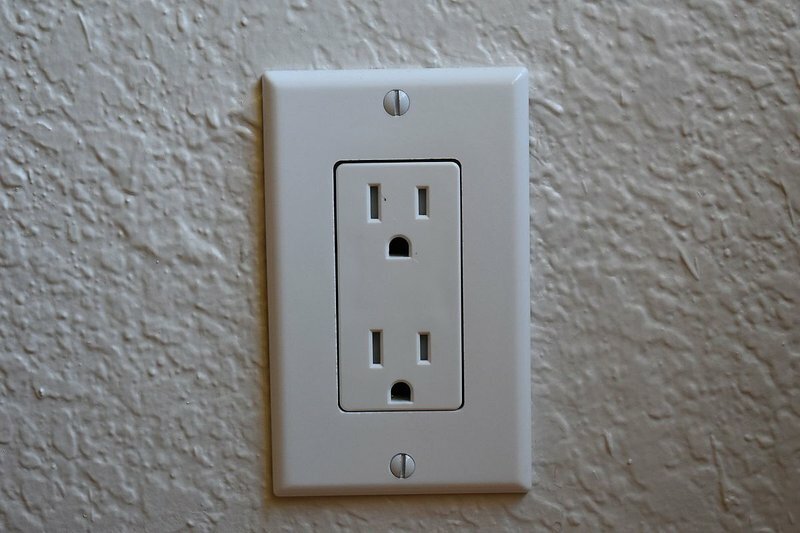 Any product that plugs directly into an AC electrical outlet requires UL certification. This certification is quite expensive typically costing more than $10,000. This is separate from the UL1642 certification required for lithium batteries, and this UL certification is for your product itself. So definitely use an external power adapter that has already been UL certified. Since the pre-certified adapter takes care of the AC/DC conversion, and your product never connects directly to the AC voltage, no UL certification is required. USB is another power option that is essentially just a standardized type of external AC/DC adapter like discussed above. However, in addition to using an external USB charger, you can also charge your product from the USB port on a laptop. Figure 6 – Charging via USB allows your customer to use any USB charger. USB is probably the most common method of recharging a battery. It’s the method that I design into the most products. It’s also the one that I typically recommend. It’s very standardized and USB allows you to also have a pre certified adaptor. The big advantage with this is that most of your customers are going to already have multiple USB chargers. If you require a specialized power charger that only works with your product, it can be a pain if the customer can’t find it. But if you allow them to use any USB charger, they can use the one that you include with your product, or any other ones they already own. Be aware though that there are different levels of USB charging. There’s what’s called the Standard Downstream Port (SDP) that is basically a USB port say, on your laptop computer..
A Standard Downstream Port can supply up to 500mA of current under USB specification 1.0 and 2.0. On the other hand, a USB 3.0 SDP can supply up to 900 mA of current. The other USB option is called a Dedicated Charging Port (DCP) which is when you have a USB charger that plugs into an electrical outlet. A DCP can supply up to 1.5A of current. It’s a pretty simple matter to have your device detect whether your product is connected to a SDP or a DCP. If it’s plugged into SDP port on a laptop, then you can limit the battery charge current to 500 mA. On the other hand, if it’s plugged into a DCP charger then you can increase the charge current up to 1.5A. Although you must be sure you don’t exceed the maximum charge current specification for your product. Another option is a solar panel. The main downside with using a solar panel is that it adds significant size. If your product is really small, it’s going to limit how much space can be devoted to a solar panel area. Obviously, the larger the solar panel the more current it can generate. But for most products the current produced by solar panels is going to be quite small. So this is going to be a slow charging process for your battery. It’s not going to charge anywhere near as quickly as a USB charger. Another power option is to use wireless induction charging. Wireless chargers transfer energy via an electromagnetic field. This is accomplished by using two coils to transfer energy using electromagnetic induction similar to a transformer. Qi is the most common standard for wireless induction charging. However, there are a lot of downsides to wireless charging. In most cases I recommend sticking with a USB charger, at least initially, unless you feel that wireless charging is a critical feature for your product. If it’s a key criteria for your product, then by all means use wireless induction charging. But if you want to add it just because it’s cool, then you are adding a lot of unnecessary cost and complexity to your product for no truly good reason. There are some other alternative power sources that may be used for charging a battery, but most of these are not really practical for current products. But I wanted to quickly mention them, because in limited cases they may be a viable option. Also, as the technology behind them improves they may become more practical in the future. RF (radio-frequency) power harvesting is one such option. RF power harvesting uses the energy of any ambient radio waves. That energy is received via an antenna and converted into a current that can be used as a power source. Sounds pretty great, doesn’t it? Just pulling free energy out of the air. The problem is that the energy in any ambient radio waves is going to be extremely small. In most cases it’s going to generate way too little power to be of much use. There is also power derived from motion. For example, you shake the device and that motion is converted into electricity which can be used to charge a battery. A few products use this method, but once again, I tend to recommend you stick with a standard charging method unless it’s a fundamental feature for your product. Lastly, there are a few interesting experimental options like harvesting power from heat or chemical reactions, but I’ve not yet seen any consumer products that use either of these methods. So finally, we’re ready to discuss the second option to power your product, replaceable batteries. Figure 7 – Alkaline batteries come in a wide variety of sizes. The majority of modern consumer electronic products use rechargeable batteries, but for many products replaceable batteries may be a better option. For example, for products that are very cost sensitive, or for products that can’t easily be placed near an AC outlet for recharging. The first question you have to decide is do you want to use an alkaline battery or a lithium battery. Here I am referring to disposable lithium batteries (technically known as lithium-metal batteries) that are not to be confused with rechargeable lithium-ion or lithium-polymer batteries. Alkaline batteries are available in all the standard sizes we’re all familiar with including the 9V, AA, AAA, C, and D sizes. Lithium-metal batteries are also available in most of these sizes, but are also available as coin cell (or watch) batteries. 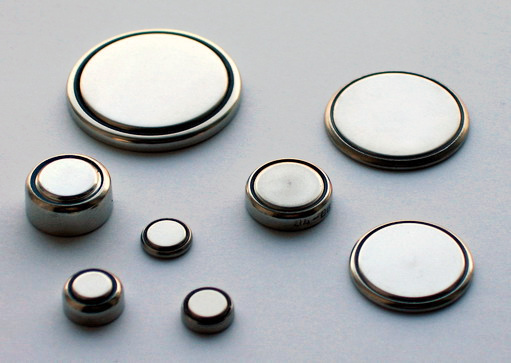 Figure 8 – Disposable lithium-metal coin cell batteries come in various sizes. Choosing your best battery chemistry will depend on your product’s application. For instance, if your product is going to be operated in cold weather, then a lithium battery is a much better solution than an alkaline battery. Alkaline batteries perform horribly in cold weather. If your product will be operated in cold temperatures, then a lithium-metal battery will be a better choice. You also need to ask, how small is your product and what are the power requirements? For example, if your product is really small and uses a small amount of power (such as Bluetooth LE) then lithium coin batteries may be your best solution. An alkaline battery typically has a voltage of 1.5V, as do lithium-metal batteries that come in standard alkaline battery sizes. Lithium coin cells on the other hand provide a voltage of 3.0V. This can impact your selection of the best battery type. If your product requires a supply voltage higher than the battery voltage then a special device known as a boost switching regulator will be required to step up the battery voltage. Finally, there is one hidden negative of replaceable batteries. You have to design a battery access door so the user can change the batteries. Obviously, if you use rechargeable batteries the customer doesn’t need to access the battery. This allows your product to be sealed shut, and you can potentially get by with only two pieces of molded plastic- a top and bottom that fit together and make your enclosure. As soon as you have a battery door, you are adding an additional, and separate, 3rd piece of custom plastic. This additional custom plastic piece is going to require a custom injection mold and molds are very expensive. In fact, mold costs are typically the biggest financial obstacle to scale a product from prototype to mass production. I recommend that you instead find an existing off-the-shelf battery access door from a vendor that already makes something similar. Find one that you know kind of matches what you have in mind for your product. Then design your enclosure around that off-the-shelf access door. Doing so will eliminate the need for an additional injection mold. And then finally, the 3rd option is AC power. First of all, the big negative with powering your product from an AC electrical outlet is it requires expensive UL certification. So you’re talking at least $10,000 to get your product certified. There are also safety issues involved (hence the need for UL certification). No one’s going to electrocute themselves with a AA battery, but with 120VAC someone can be seriously electrocuted or injured. Unless your product incorporates AC components (such as an AC motor or heater) then you will at some point need to perform some AC/DC conversion. In addition to paying for expensive UL certification, internal AC/DC conversion circuitry can add additional size to your product. This is why in most cases I recommend using an external AC/DC converter if your product uses DC power. Like I mentioned previously with the rechargeable batteries, make sure that if you use an external AC/DC converter that you use one that’s pre-certified. John, this is a solid article. Honestly, it’s so easy to get LiPos that I kind of glossed over the safety considerations. The info you provided about certifications really opened my eyes. I called out this article in a recent Instructables post so I hope you’ll get a little bump in traffic. Thanks John, that’s great! Wow, that is an impressive Instructable you wrote! Thanks for sharing. Hi bro! Great article. What do you think about using parallel capacitor with coin cell for Bluetooth Low Energy applications to improve battery life time? Is it really needed? You are most welcome Michael. A cap in parallel with a battery has no impact on battery life. Such a cap simply acts to help “smooth” out the voltage and provide current during transients. Excellent Article! I wished I had read this before starting my hardware development! Thank you John. This article was very helpful . I’m glad you found it helpful David! Thanks for the comment. As usual, John, an excellent article! Made battery and charging related things very clear. 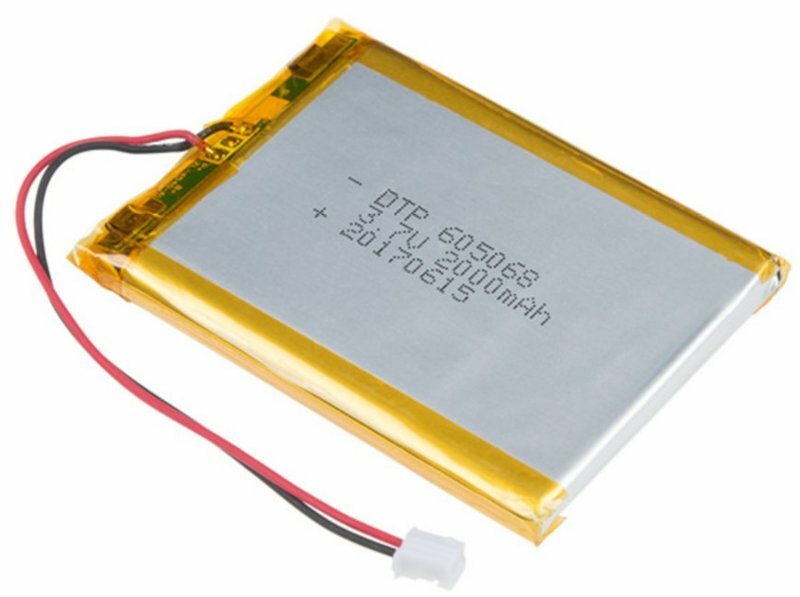 A question though; Do these rechargeable battery chargers for Li-Poly batteries charge these batteries at the same time they are being consumed by the product? Also, if the the end product power requirements are very low, how does one configure a solar panel output with a Li-Poly charger considering the varying output of solar panel throughout the day? Do these chargers require steady input? Thanks for the positive comment! There are many battery chargers available with a feature known as Dynamic Power Management (DPM). DPM also you to design the charger so that any extra current available is used for charging the battery. For example, if your AC/DC adapter is capable of sourcing up to 1A, but your design is consuming 600mA, then the remaining 400mA of available current will be used for charging the battery. If the system pulls all of the available current then no current will be left for charging. There are special charger IC’s specially designed for use with high-impedance sources like solar cells. Interesting article. 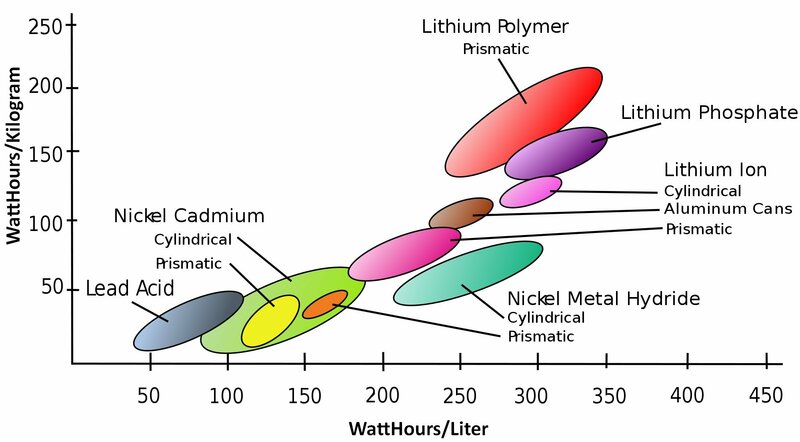 However, I’d like to add something: not all Li-ion (and consequently LiPo) batteries have the same cathode chemistry (the anode is almost always graphite) and properties. The most common cathode chemistry is LiCoO2 because it provides high specific energy with moderate cycle life and they’re cheap. However, these are also the most dangerous. Another common one is LiNiMnCoO2 (used by Panasonic in the NCR18560Bs), which also has high specific energy, a higher cycle life and they’re safer, but they a bit more expensive. The last common one is LiFePO4, which has pretty low specific energy and they’re more expensive, but they have a very high cycle life and they’re much safer (comparable to alkaline batteries). BTW, you say that “A single lithium-ion battery cell is commonly similar in size to a standard AA alkaline battery”, but 14500 (AA size) Li-ion batteries are rare and the most common size (found in almost all laptop batteries, electric car batteries, power banks…) is 18650, which is significantly larger than an AA (about 1.65x the size). And one more thing, you say that “AC/DC conversion can commonly be large and heavy with a transformer”. But that’s not the case nowadays. I only have, at most, two AC adapters which use a big, heavy transformer. And I don’t use them! All of the AC adapters I’m using (there are about 12 of them plugged in!) use SMPS, which at most uses a little and light transformer for isolation, so they’re compact and lightweight. 1) Thanks for the info and for clarifying the cathode chemistry differences available in Li-ion batteries. 2) The 18650 is what I had in mind and is the cell I’ve used most frequently. I realize its larger than a AA battery but the AA battery was the closest common battery size that people already know. But I should have been more clear on the size. I’ve updated the wording to make it more clear that most lithium-ion cells are larger than an AA battery. 3) My assumption was the use of an offline SMPS converter with only an transformer for isolation purposes. Many of the products I design are incredibly small (lots of wearable and IoT products) so even a small isolation transformer adds significant size (although not much weight). Nonetheless, I should have been more clear about this so I’ve rewritten this section to eliminate the “heavy” comment. Thanks again for your feedback and for regularly commenting on my articles. Your comments are always full of good info and very helpful. Awesome, another perfectly timed article on the various power sources. We are definitely looking to use a standard USB power adaptor to power our relatively low power motor inside our device; but we did investigate using the newer USB-C standard, with more power available, but seems the adaptors are still quite pricey. But, is this type of detection required to be designed in the main board circuitry, or are there USB female Type A breakout connections with this built in, that can be incorporated into the product being developed? Thank you Anil for your excellent comment! Port detection is done on the main board circuitry. You will either want a special port detector IC or a charger IC with it built in (like the MAX8895).